I don’t think I’d be stretching my imagination – or my ego – to assume that you’ve all missed me dearly. I am not proud to state that I have done exactly what I promised myself I wouldn’t do on the last day of JMC305 class. I let my blog get ignored. Luckily, I came around. Now, here I sit again in front of my beloved XOXO, Salsa Girl blog with a rejuvenated energy. I cannot event begin to articulate how far I have come since my last blog post. I completed that post on Nov. 13, 2012 and today is June 6, 2013. As it stands, I am not entirely sure how I’d like the future of this blog to play out. In theory, I’d like to upkeep some type of journaling whilst I am doing my thing here this summer, but realistically I think I can only spread my words so thin, and you all can only stand so much of me. There’s nothing more frustrating than not knowing where to go out for dinner. It always seems like the lists go on-and-on when you aren’t trying to pick where to go, but as soon as you need to think of where to chow down, you brain fart. I know that there is nothing worse than that brain fart. Except for ….well, we won’t go there. So I’ve decided to create this map to help prevent any frustration when choosing a Mexican meal. I have reverted back to the Myspace days and created a Mysalsa “TOP 8” with Mexican food restaurants. Additionally, I have included a brief explanation why I love each. Just like we used to claim about our friendship rankings, I will say here too: these are in no particular order. They have the most delicious chips in the world. Some of their chips are dusted with sugar, while others are coated in zesty seasoning. 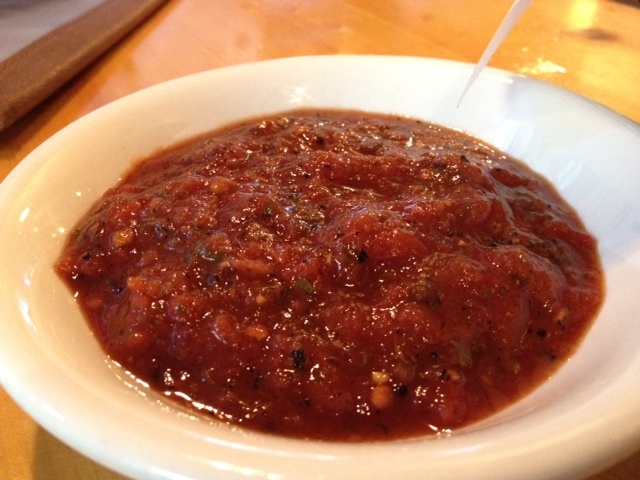 The salsa is house-made, somewhat sweet and really roasty. My tagline for this place is “You can taste the difference.” The vegetables, the meat, the tortillas, and everything in between are fresh and they just taste different. They use organic ingredients and it makes all the difference. You won’t leave this place feeling heavy like you do after most other Mexican restaurants. The old-school restaurant (it’s been there for nearly 40 years) environment here makes the food taste even better than it would if it were served anywhere else. Their chips are crispy and served warm. Hands-down, the best menu item is the “Mary Lou” with green chile. That dish holds a special place in my heart because it is the dish my mom always orders. Hi Mom. This is not necessarily a Mexican restaurant, but their Mexican food is insanely amazing. The chilaquiles that they serve for brunch are the single most delicious breakfast dish I have ever tried. Also, all tacos are incredible. And so is everything. This is both the least expensive and the most “classic” of all of my top 8. Their salsa is so fresh and chunky (and I drink it by the cup-full) and the burritos are only around $4. The classic bean and cheese burrito is the best, just because it is. This place wins all types of awards, and it has been on Diners, Drive-Ins and Dives. Their street tacos are only $1.15 or $1.25 each, and legitimately taste like the tacos I have had in Mexico. Their hot sauces are so amazing and spicy as well. I could go on for days about this place. Maybe one day I will do just that. This one also holds a special place in my heart. It is my granny’s favorite. They serve bean dip at the beginning of the meal–which is an automatic point-earner. They also whip up a fantastic chorizo and egg burro that I love. There’s lots of nostalgia associated with this place for me too. If we’re ranking based on ambiance, this place is up in the top (with Gallo Blanco and Tee Pee). At Valle Luna, you can eat your fajitas while overlooking a lake. It doesn’t get much more sizzlingly tranquil. Hopefully, unlike that which ensued when I used to rearrange my Myspace Top 8, there will be no drama as a result of this post. Categories: Reporting | Tags: burrito, Chelsea's Kitchen, gallo blanco, los taquitos, mexican, myspace, restaurants, sam's cafe, serrano's, tee pee, valle luna | Permalink. The Arizona Republic came out with their endorsements for candidates and ballot propositions for the general elections about a week ago. So, I too have decided to offer my readers (hi mom) my very own, exclusive XOXO, Salsa Girl 2012 Salselections endorsements. I have single-handedly consumed around 12-15 jars of these just this school-year. 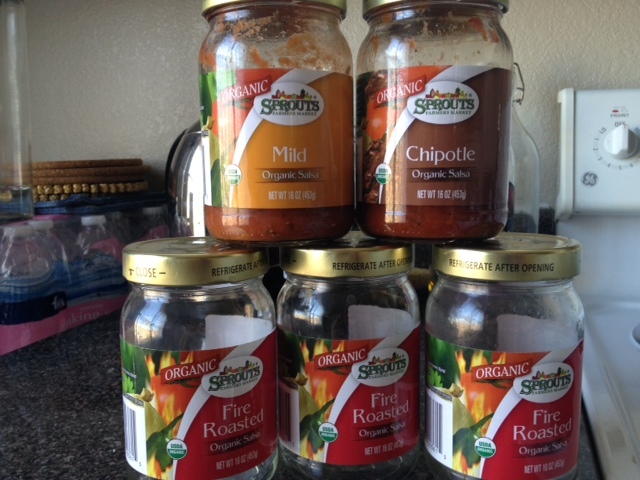 Sprouts Organic Fire Roasted and Chipotle salsas are both incredible. They both have alot to offer the economy of the salsa world, both work well with other foods. But when it truly comes down to the nitty-gritty taste-test, the Chipotle gets my vote. I remember growing up (and walking 10 miles in the snow uphill barefooted to school) and going to the farmers market or festivals and to get Lil’ Sassy’s Salsa. I boldly approached the woman behind my favorite hand-canned salsa a few weeks ago to learn more. THRILLING BACKGROUND INFO ON LIL’ SASSY’S SALSA: owner Rose Llanuza kindly gave me the full rundown of how her flourishing salsa brand came to exist. It all started when she planted chile peppers in her backyard and a had a few too many. Llanuza then started experimenting with different recipes, chose the name Lil’ Sassy’s Salsa because “everything else was already taken,” and she’s been branding herself ever since. “In Germany, everybody cans. It’s just what you do,” Llanuza said. While they may ‘can’ sauerkraut in Germany, this is Arizona and she ‘cans’ salsa like nobody’s business. Yes we can! In what was the hardest decision of all, I finally came to conclude that Sam’s Cafe at The Arizona Center has the #1 best chip and salsa combination. I interrogated waitress Sarah Becker about her chips and salsa. 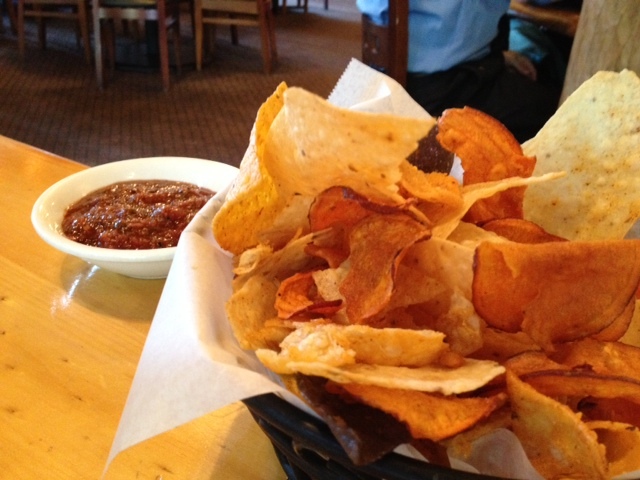 Sam’s Cafe makes both their chips and their salsa in-house. “Behind the scenes we call it ‘roja salsa,’ but to customers it has no name,” Becker said. I had to chuckle when she said this about their roasted red salsa. It’s true, customers don’t care if it has no name, they just want to eat. THRILLING INSIDER SCOOP ON THEIR CHIPS AND SALSA: Their chips are incredible, too, because they are either seasoned with “New Mexico blacken seasoning” , sweet and spicy seasoning and powdered sugar (on the wonton–yes, wonton–chips ) or just salt (on the sweet potato chips). Becker also taught me that they let their salsa marinate for a whole day, and each batch takes two days to complete. I love to catch waiters off-guard when I ask them about their chips and salsa. Nobody asks questions when the chips and salsa are free. Except for me. I want to be an informed voter, so I always get the scoop before I place my votes. There you have it: The Official Salsa Girl 2012 Salselections. I love this political system because no matter who wins, I get to eat salsa. Categories: Reporting, Uncategorized | Tags: candidates, elections, lil' sassy's salsa, sam's cafe, sprouts | Permalink. Chips, Salsa, Ahi Tuna and Elections 2012–Which doesn’t belong? BREAKING NEWS: My roommate/best friend/co-partner in excelling at life/classmate, Amelia Goe, and I rule the journalistic world. We just scarfed down two heaping bowls of chips and salsa and a full serving of seared ahi tuna and rice during class time while simultaneously discussing politics and practicing journalism. We wondered: What’s harder to choose: what to eat for lunch or who to vote for president? As it turns out–our presumptions were correct. Food is easier. 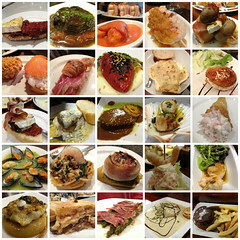 Check our quick turn-around mobile story, Menu vs. Ballot. Categories: Reporting | Tags: chips, elections, mobile, politics, president, salsa, sam's cafe | Permalink. I tend to treat tacos as only a means of transportation for getting salsa into my mouth. 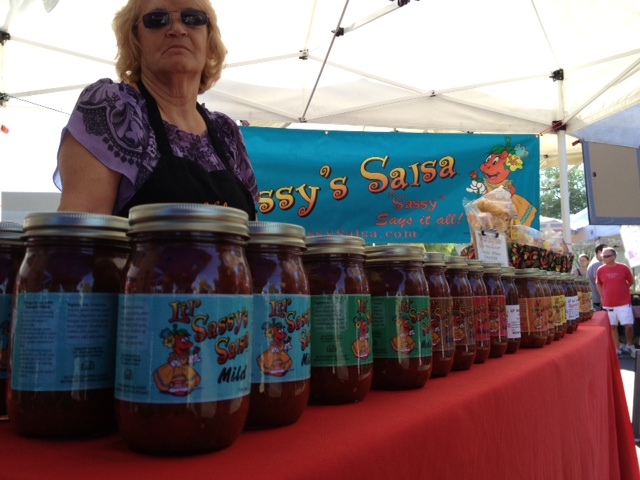 However, the Arizona Taco Festival this weekend taught me that salsa can’t always be the star of the show. When it comes to tacos, salsa is to act in a supporting role to whichever meat or seafood the chefs have chosen as their superstar. I attended the festival with an open heart, an open mind, and an empty stomach. After my friend and I spent a solid 25 minutes observing the overwhelming options of taco stands, avoiding the “see-and-be-seen” tequila bars, and giggling at the sombrero-adorned drunks, we made our first taco stop. 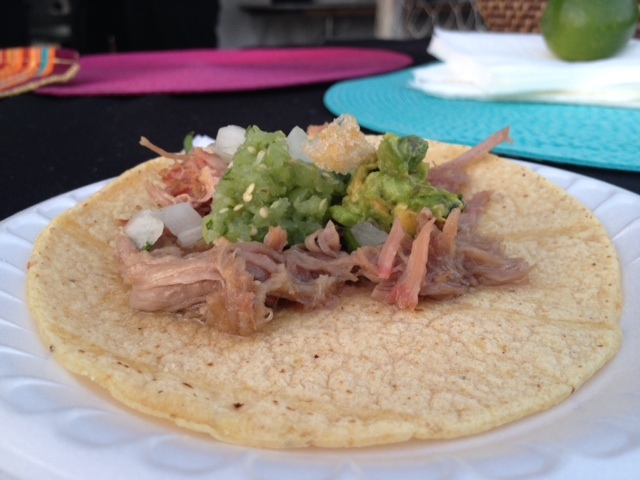 Chelsea’s Kitchen had their mouthwatering carnitas tacos out on display. I’ve been to Chelsea’s Kitchen before, and I can honestly say it makes my Top 5 list of best restaurants. EVER. Before I indulged, Executive Chef Jorge Gomez was kind enough to step away from his pop-up kitchen to teach me about his tacos and salsas. 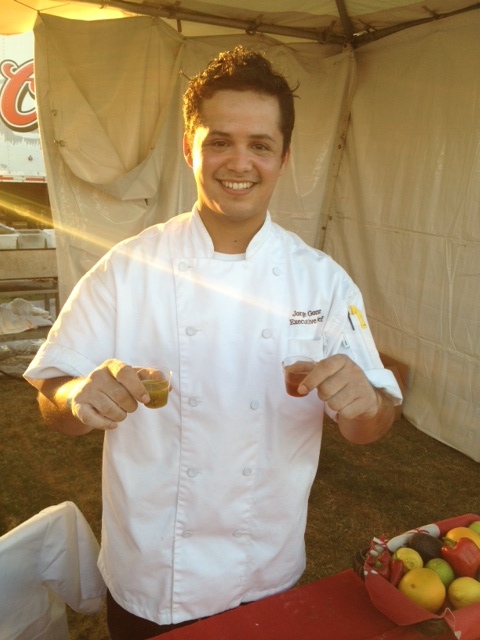 Gomez had his green tomatillo and red charred salsas at the festival, and he poured me little shots of each one to taste. The tomatillo had that tangy, acidic taste that I love, and the red charred one was smoky and slightly sweet. Gomez said that the charred salsa is served with every taco on the Chelsea’s Kitchen menu, and he said the restaurant goes through about 10 gallons of the red and 5 gallons of the green each day. As for the actual taco that he was serving, Gomez walked me through the line up of rotisserie-cooked and sliced pork that is simmered in ranchero sauce for four hours, and served on a corn tortilla with pico de gallo and guacamole. 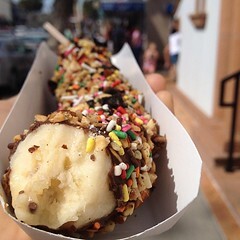 Hi, get in my belly. 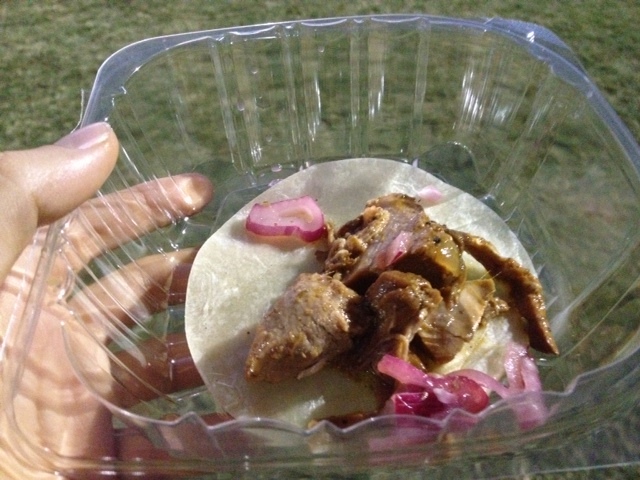 SOL Cocina also put their best pork foot forward at the Taco Festival. 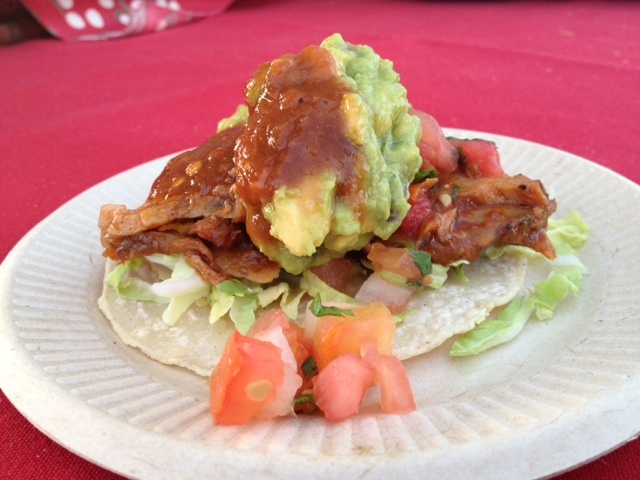 They were serving up carnitas street tacos with slow-roasted and shredded pork, chicharron (fried pork skins), onions, avocado, and a tomatillo salsa on a gluten-free tortilla. SO TRENDY! General Manager, Jessica Kortas, said that SOL Cocina has 17 different salsas that they make from scratch, and each salsa is specifically made and served to compliment a taco. 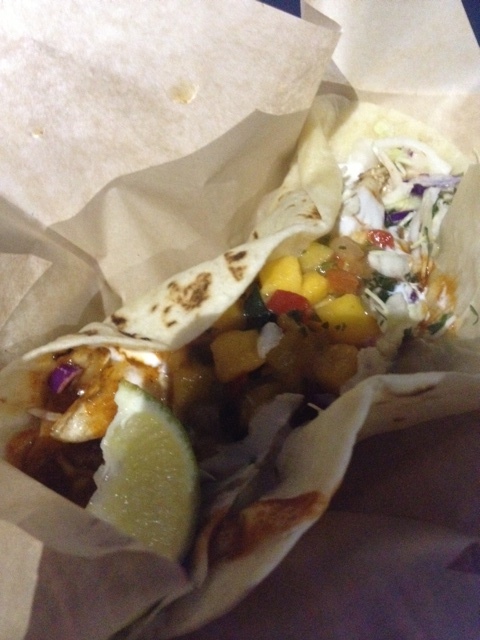 After a bit of wavering, Kortas said that her favorite taco on the menu is the Grilled Fish Zarandeado that has a pineapple-cucumber salsa, because she said the fish and pineapple perfectly compliment one another. I had a total of 5 tacos over the course of the evening. No shame. The next three that I tried were inferior to the first two, but delicious nonetheless. 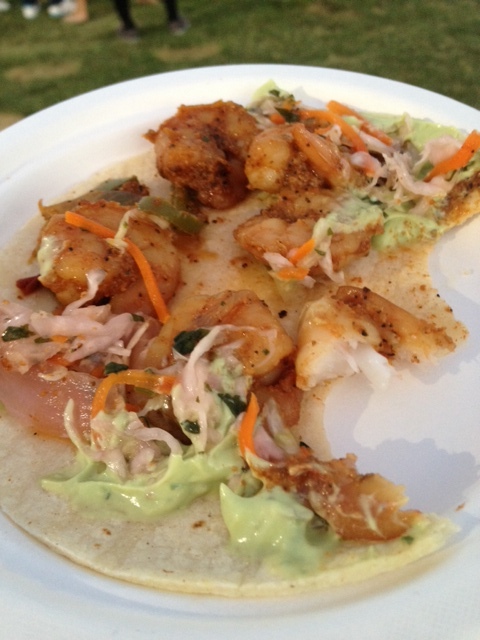 I tried a “Puerto Nuevo” shrimp taco from Tonto Bar & Grill , which is a unique Native Arizona inspired eatery. Their taco had shrimp, peppers and onions, an avocado crema sauce, and a delicious slaw with carrots that they call “Escabèche Slaw.” I am a fan of any avocado-cream-ish-sauce, so I really enjoyed this one. Macayo’s was serving the most non-photogenic cochinita pibil (slow-roasted pork) taco in existence. I could tell the Macayo’s tent crew was tired of serving tacos all day. I ended my rounds with a fresh mahi-mahi taco with a mango habanero salsa from Rubio’s, and I walked out of the festival gates while simultaneously eating this taco. 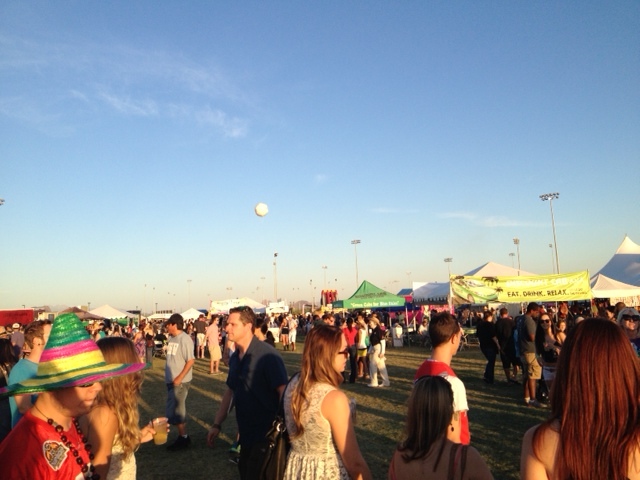 Categories: Events | Tags: Arizona Taco Festival, carnitas, Chelsea's Kitchen, festival, fish, Macayo's, pork, Rubio's, salsa, SOL Cocina, tacos, Tonto Bar and Grill | Permalink. Despite the continual growth of his signature salsas, owner Ken Smith of Sting ‘N’ Linger Salsa Company still stirs every individual batch by hand. Each of Smith’s 12 Signature Salsa flavors are made locally in his production facility in Tempe, Arizona using fresh ingredients and his own original recipes. For many years, Smith sold his specialty salsa at Farmer’s Markets, but now Sting ‘N’ Linger products are available on the shelves of commercial grocery stores (including Fry’s Food Stores, AJ’s Fine Foods) and specialty shops throughout Arizona. Watch this video for a mouthwatering “behind-the-label” look at Sting ‘N’ Linger Salsa Company. Grab a chip, sit back, relax, and prepare for some sting…and prepare to have that sting linger. Categories: Reporting | Tags: aj's fine food, arizona, farmers market, fry's food stores, ken smith, production, salsa, sting 'n' linger salsa company, tempe | Permalink. Unfortunately, I did not get a promotion. 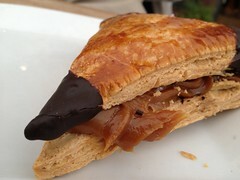 However, I did get to try Rooster’s Beak once and for all. It was just my luck that Fatima decided to whip up a batch of her proclaimed “real” Pico de Gallo and she felt kind enough to share some with me. I was expecting the lime juice and salt to oddly conflict with the mango and watermelon, but lo and behold–I was wrong. The perfectly crispy cucumber slices perfectly absorbed the juicy runoff from the watermelon, and the mango gave its own tropical flavor. 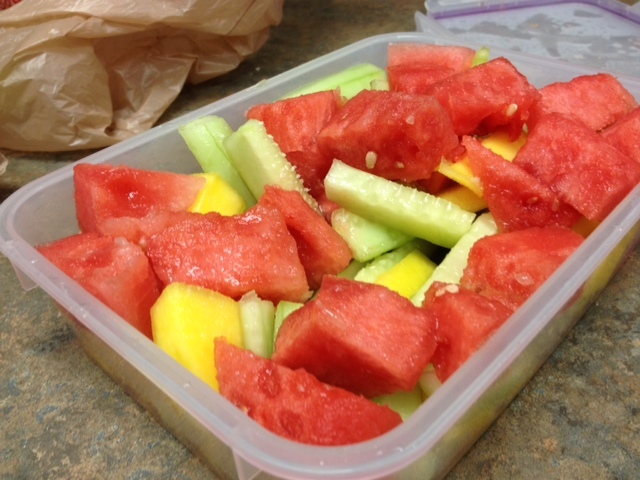 Each fruit was distinctively sweet, and the cucumber was refreshing. Regardless, that’s what came to my mind as I ate her pico. Rooster beak, I love you. Categories: Salsa Basics | Tags: cucumber, fresh, lime, mango, pico de gallo, watermelon | Permalink.